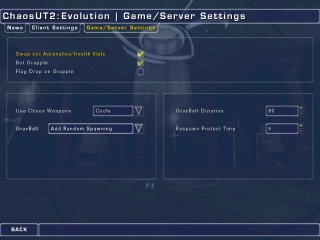 Use these settings for offline botmatches, or to set up your server. Swap out Adrenaline/Health Vials – Checking this option will randomly swap out adrenaline pills and health vials with Chaos armor shards. Bot Grapple – Check this option if you want the bots to use the grappling hook. Flag Drop on Grapple – If you do not want players to be able to carry the flag in CTF while using the grappling hook, then check this option. The flag will be dropped automatically when the grapple is fired. Use Chaos Weapons – Choose from 3 ways to implement the ChaosUT2 weapons. Always – The Chaos weapons will replace their UT2 counterparts for the entire match. 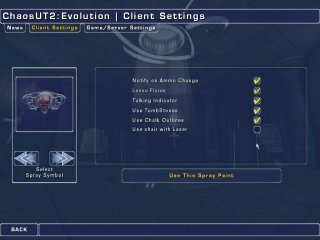 Cycle – The Chaos weapons will cycle with their UT2 counterparts. Never – In this mode you play with all features of Chaos mutator, but the Chaos weapons will not spawn. GravBelt – Choose from 3 ways to implement the ChaosUT2 Anti-Gravity Belt. No Additional Belts – No GravBelts will be added to the maps. Add Random Spawning – GravBelts will be spawned randomly on pathnodes throughout the map. Players can pick them up and use them, and they must find another belt in order to recharge. Start with A GravBelt – Players will be given a GravBelt when they enter the game, and each time they respawn. These belts will automatically recharge when they are not in use. GravBelt Duration – Set the length of time the Anti Gravity Belt will last, unless recharged. Respawn Protection Time – Useful for configuring your respawn protection time in offline matches. 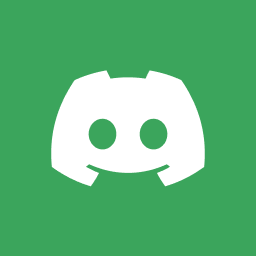 This is overridden by server settings when playing online. These settings only affect your game, not other players on the same server. Select Spray Symbol – Use this menu to choose a logo that you can spray on surfaces while in-game. Bind a key in the controls section to paint the logo. Notify on Ammo Change – When you hit the ‘change ammo’ button to change ammo types, this will give a text messages on screen letting you know what type has been loaded. Works just like the text you see when you change weapons. Lens Flares – Check this option, and you will see lens flares in maps which use the Sunlight actor. Talking Indicator – Check this option, and you will see an icon appear over any player that is typing. Use Tombstones – When checked, whenever you get special frags (ie; killing spree, multi-kill, etc) you will be rewarded with tombstones rising up out of the ground, that bear the names of your victims. They are non-solid, and last for about 90 seconds. Use Chalk Outlines – When checked, this option will draw chalk outlines underneath players each time you get a frag. Use xhair with laser – When checked, this option will draw a crosshair on top of the laser dots of the rocket launcher and sniper rifle. 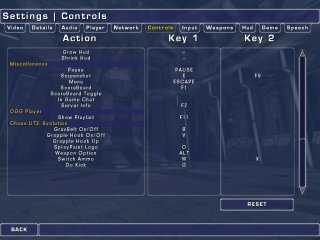 The Chaos keybinds are found in your regular Settings | Controls menu, along with all your standard UT2003 controls. GravBelt On/Off – Turns Anti Gravity Belt on or off. Grapple Hook On/Off – Main key for firing/stopping/releasing the grappling hook. Grapple Hook Up – For use when hanging from your grapple cable. When the weight of your body lowers you down the cable, hit this key to be pulled back up. NOTE: This key is optional, and is not required to use the grappling hook. SprayPaint Logo – Choose a logo in the Chaos configs, and use this key to spray it on walls while playing. Weapon Option – For the Chaos weapons that support it, this will toggle on and off the alternate secondary fire mode. Switch Ammo – Use this one key to change ammo types on all Chaos weapons with multiple ammo types. Do Kick – Use this key to ‘kick’ players and objects away from you.